On March 17, people around the world celebrate the Irish holiday of Saint Patrick's Day. It is a major holiday in Ireland, but the rest of the world has influenced its celebration as much as the Irish themselves. 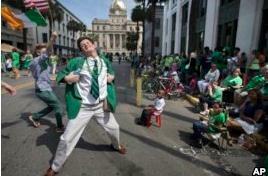 Most Americans think of Saint Patrick's Day as a big party centered around drinking alcohol. But its beginnings in Ireland were religious, says Mike Cronin, a professor of Irish history with Boston College of Massachusetts. Ireland is a mostly Roman Catholic country. Saint Patrick lived in Ireland more than 2,000 years ago. He is widely considered to have established Christianity in the country. The Church honored him with a holy day in the 17th century. March 17 marks the date of his death. St. Patrick, a Briton reportedly, is believed to have served in Ireland as a Catholic Bishop. One traditional story says that St. Patrick drove all the snakes out of Ireland. The average Irish person honored March 17 quietly. Attending church services was the main activity. In fact, most businesses that served alcohol would close in honor of the day. In the early 1900s, Ireland's government made St. Patrick's Day an official holiday. By the 1960s, towns across Ireland started celebrating the holiday with parades and music. In Ireland today, St. Patrick's Day is a four-day public celebration that includes parades, music, food, and games. For Irish people living outside Ireland, Saint Patrick's Day became a chance to celebrate their Irish identity and culture. It's very much a day by which the Irish put themselves center stage, Cronin said. Now, countries and cities around the world celebrate March 17 in creative ways. Many countries hold Saint Patrick's Day parades. Famous monuments, including the Great Wall of China, the Colosseum in Rome, the Niagara Falls, and the Gateway of India in Mumbai will all be colored by green light for the day. The U.S. is especially famous for its Saint Patrick's Day celebrations. Many cities with large ethnic Irish communities, like Boston, New York and Chicago, hold parades and parties. Cities will also color local rivers green for the day. Ireland is known as the Emerald Isle. The country is covered in deep green grass. Cronin says that the worldwide popularity of Saint Patrick's Day has helped the Irish government, which uses the holiday as a form of diplomacy. So what you have is this quite remarkable day where literally over much of the globe, everybody, whether they're Irish or not, the one thing they do know is the 17th of March is Saint Patrick's Day. And for a small island of 4.5 to 5 million people it's quite remarkable that they have that kind of soft power. However, Cronin says many modern Saint Patrick's Day traditions were invented by the Irish in America. In the U.S. on Saint Patrick's Day, it is common for Americans to drink green beer or eat corned beef and cabbage. However, Cronin, says, many of these traditions are not really Irish. You could walk around the streets of Dublin all day and not find any corned beef and cabbage, he said. Neil O'Flaherty, an Irish citizen now living in the U.S., agrees. Growing up in a small town in Ireland, O'Flaherty remembers celebrating Saint Patrick's Day much differently than it is now. Back then, for Catholic families, it was the day you had to go to church, you were required to go to Mass on that day. It had much more the feeling of a religious holiday than a public holiday. He also remembers everyone wearing small, three-leaf plant pieces, called shamrocks. O'Flaherty said that he was surprised to see how much Saint Patrick's Day in the U.S. has become linked to drinking lots of beer or other alcoholic drinks. However, there are some Irish connections between drinking and Saint Patrick's Day. One tradition that does come from Ireland is called drowning the shamrock. Cronin explains that this tradition involved taking the shamrock that people wore all day, and placing it in a glass of whiskey or beer before drinking it. Professor Mike Cronin suggests it is not that important how people celebrate March 17. He calls Saint Patrick's Day "a day for everyone to be Irish." He's just come from the countryside. Switzerland is famous for its milk and cheese. 3.O'Flaherty said that he was surprised to see how much Saint Patrick's Day in the U.S. has become linked to drinking lots of beer or other alcoholic drinks. Tony brings Jamey to the secure room and she is surprised to see Nina alive. A few weeks later, Joe's former psychoanalyst meets his old client inthe supermarket, and is surprised to find him looking well-rested, energetic, and cheerful.